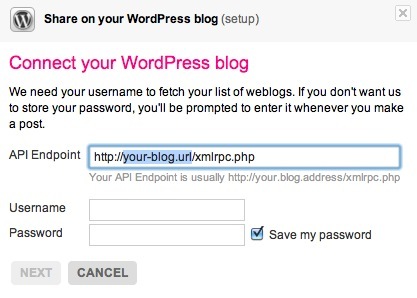 Be sure your WordPress Settings for Writing and make sure the option for “Enable the WordPress, Movable Type, MetaWeblog and Blogger XML-RPC publishing protocols” is checked. This allows third party apps (that you select/approve) can publish to your blog. In Flickr, go to your account options for sharing and under the “more sites” options, click WordPress. One this connection has been made, see the options under “Select a Layout”; this allows you to choose what format flickr uses to post (I like the large image one). There are more options to customize the output even kore. Once this is set up, you can post a blog post from any of your own flickr images. 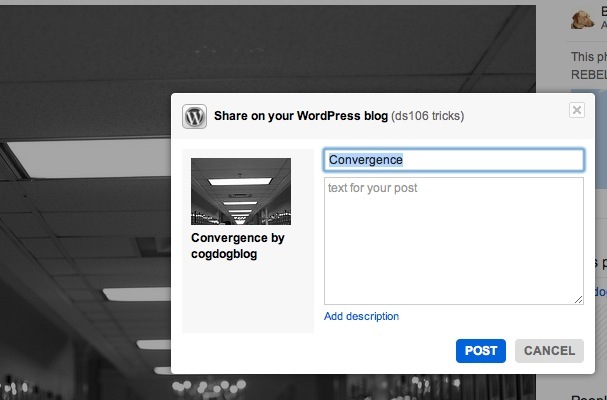 Just load up the image page, and look for your blog under the “Share” button above the photo. 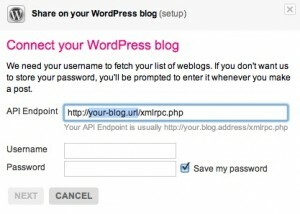 You can then enter title for the new blog post, and write the content that will be your blog content. That’s it! Now when you put your daily create in flickr, you can just write a post to your blog without even going to your blog.